Let me start out by saying that my mother hates buses with a passion. So when she suggested taking a bus, of course I said yes! The bus in question was the 350, which I had actually been wanting to take for a while. The route travels to Mass Ave, then goes onto Mystic Road/Route 3 at Arlington Center. It makes its way up to the Burlington Mall and its terminus up in North Burlington. Arriving at Alewife, my mother and I looked around the maze known as the Alewife busway for the bus. When we found it, some MBTA workers were having a conversation. They told us to wait a couple berths away while they talked. We waited for 10 minutes for the workers to stop talking. Finally, the bus started up and we got on. Leaving Alewife, the bus had about 15 people on it, which is a lot if you think about the fact that we hadn't even made any stops yet. Travelling along Mass Ave, there are a lot of businesses along the route. Eight people got on at Arlington Center, which I actually found kind of surprising (we also noticed a snail on the window of the bus, but snails don't pay fares). Once it turned off of Mass Ave, it became very residential. The bus pretty much ran express during this portion, though there were a whole bunch of stops being announced. I'm assuming on weekdays, people use these stops, but it was quiet on a Saturday. There was also some stuff to see, primarily the Mystic Lakes. There are some businesses at Woburn Four Corners, and then it's back to residences. Near Route 128, the bus turns off of Cambridge Street (which Mystic Street turns into) and goes by some office buildings. Again, on weekdays, people probably use the stops on this portion of the route. The bus goes onto Burlington Mall Road and drops people off at Macy's. On our trip, almost everyone (including us; I'll have to go up to the terminus some time) got off at the mall, except for two people. Soon, it was time to take the return trip. After waiting for a while, the bus came. 14 people got on, including us, and one person had come from Burlington. The bus went very fast through the residential area, and it was actually very relaxing. For the sake of this review. I stopped myself from falling asleep, but I probably would've. Ridership: On weekdays, probably people going to those office buildings I mentioned. On weekends, people use it to get to the Burlington Mall. There are also a few small malls along the way, but they don't generate as much ridership. There was a max of 27 people on the bus, which is a lot, especially for a weekend. Pros: It's the only Alewife bus that goes on Sundays! 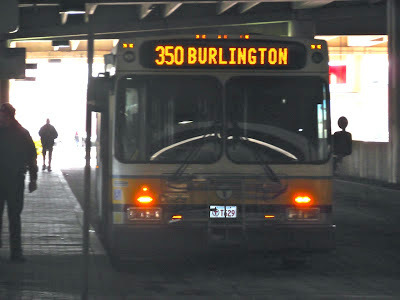 Also, it's great having a bus connection to the Burlington Mall. The 350 also has its own spin-off of sorts, the 351 express bus to the EMD Serono Research Center in Billerica. However, it only runs on weekdays, four times a day. Cons: Considering how many people used it to get to the mall, the headways seem criminal. It runs every hour on weekends. Every 45 minutes or even every half hour would be much preferred, and it might boost ridership. Also, the waiting area at the Burlington Mall is just the area that you walk into to get into the mall. You're forced to just lean on the wall, which isn't very comfortable. You'd think the MBTA could spring for a bench or two. Nearby and Noteworthy: The Burlington Mall - duh! Also, though I'm not a gardener, I still enjoy the occasional visit to Mahoney's in Winchester. And Punjab in Arlington Center is absolutely the best restaurant ever (if you like Indian food). Latest MBTA News: Due to the incoming blizzard, the MBTA is shutting down all service at 3:30 PM today. Don't plan on taking any long train or bus rides, or else you might get stuck. Hi Miles, I'm curious about how long it took to get from Alewife to the Burlington Mall. This sounds like an interesting route. Can you post a link to the route map? I'm sure I can find it myself, but I'm lazy! (Or maybe you did and I don't see it. If that's the case it's because besides being lazy, I'm old!) Love the blog. When you get to the website, click "Interactive Street Map." I live in the Acton/Lexington/Concord area and I was thinking, it takes me 20-30 minutes to get to burlington and since you live closer to boston than I do, than shouldn't it take you longer than that? Maybe it's the bus route? ya maybe I go a different way! thanks!